Definition - What does Eka Pada Adho Mukha Svanasana mean? Eka pada adho mukha svanasana is a standing inversion that requires balance and flexibility. The name comes from the Sanskrit, eka, meaning “one”; pada, meaning “foot"; adho, meaning “downward"; mukha, meaning “face”; svana, meaning “dog”; and asana, meaning "pose." To enter the pose, begin in downward-facing dog. With the hips aligned, lift one leg off the ground and extend it upward. For a deeper expression of the pose, bend the knee of the lifted leg. Open the hip of the lifted leg and drop the heel toward the hip. Repeat on the opposite side. 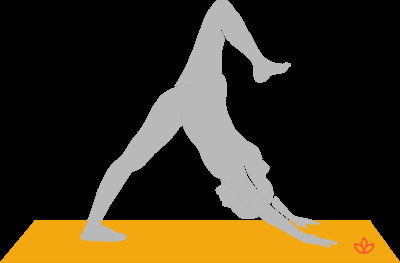 It is known in English as one-legged downward-facing dog pose. Eka pada adho mukha svanasana is an advanced variation of one of yoga's most fundamental poses, adho mukha svanasana, more commonly known as downward-facing dog pose or, simply, down dog. Traditionally, eka pada adho mukha svanasana is believed to activate the muladhara (root), manipura (wisdom) and ajna (third eye) chakras. Opening the muladhara chakra provides stability and grounding, while activating the manipura chakra offers confidence and self-motivation. Stimulating the ajna chakra develops inner knowledge and imagination. Beginners and those with limited flexibility may choose to keep the raised leg lower and bend the raised knee.